Introduction: Occipital condyle fractures (OCFs) are considered to be rare injuries. OCFs are now diagnosed more often because of the widespread use of computed tomography. Our aim is to report the incidence, treatment and long term outcome of 8 patients with OCFs. 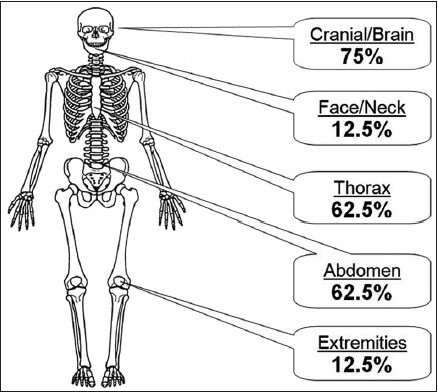 Materials and Methods: All patients presenting with multiple trauma from 1993 to 2006 were analyzed retrospectively. Characteristics and course of the treatment were evaluated. Follow-up was performed after 11,7 years (range 5,9 to 19,3 years). Results: Nine cases of OCF in 8 patients were identified. All injuries resulted from high velocity trauma. The average scores on the ISS Scale were 39,6 (24-75) and 7,3 (3-15) on the GCS. According to Anderson's classification, 5 cases of Type III and 4 cases of Type I fractures were identified. According to Tuli's classification, 5 cases of Type IIA and 4 cases of Type I were found. Indications for immobilization with the halo-vest were type III injuries according to Anderson's classification or Tuli's type IIA injuries, respectively. Patients with Tuli's type I injuries were treated with a Philadelphia collar for 6 weeks. In one patient with initial complete tetraplegia and one with incomplete neurological deficits the final follow-up neurologic examination showed no neurological impairment at all (Frankel-grade A to E, respectively B to E). At follow-up, 3 patients were asymptomatic. Four patients suffered from mild pain when turning their head, pain medication was necessary in one case only. Discussion: OCF`s are virtually undetectable using conventional radiography. In cases of high velocity, cranio-cervical trauma or impaired consciousness, high resolution CT-scans of the craniocervical junction must be performed. We suggest immobilization using a halo device for type III injuries according to Anderson's classification or Tuli's type IIa injuries, respectively. Patients with Tuli's type I injuries should be treated with a Philadelphia collar. 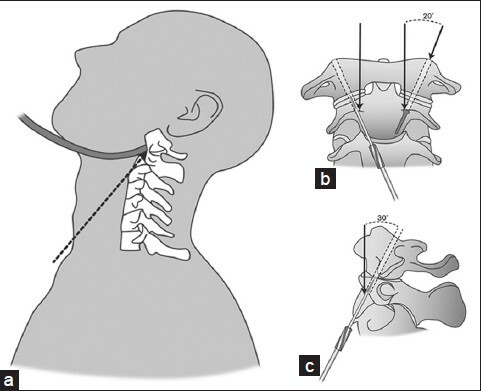 Aim: The author discusses an alternative technique of segmental cervical spinal fixation. Material and Methods: The subtleties of the technique are discussed on the basis of experience with 3 cases with a follow-up of between 30 and 36 months. Technique: The technique involves debridement of facetal articular cartilage, distraction of facets, jamming of 'Goel spacer' into the articular cavity and fortification of the fixation by lateral mass plate and screw fixation. The 'double-insurance' method of fixation is safe for vertebral artery, nerve roots and spinal neural structures and the fixation is strong. Conclusions: The discussed technique is safe and provides a strong fixation and a ground for ultimate arthrodesis. Context: Treatment of Hangman's fractures is still controversial. Hangman's fractures Type II and IIA are usually treated with surgical procedures. Aim: This study aims at describing the Neurospinal Academy (NSA) technique as an attempt to achieve an approximation of the fracture line to the axis body, which may be used for Type II and IIA patients with severe displacement and angulation. Settings and Design: NSA technique both pars or pedicle screws are placed bicortically to ensure that anterior surface of C2 vertebral body will be crossed 1-2 mm. A rod is prepared in suitable length and curve to connect the two screws. For placing the rod, sufficient amount of bone is resected from the C2 spinous process. C2 vertebral body is pulled back by means of the screws that crossed the anterior surface of C2 vertebral body. Materials and Methods: Hangman II and IIA patient are treated with NSA technique. Result: Angulated and tilted C2 vertebral body was pulled back and approximated to posterior elements. 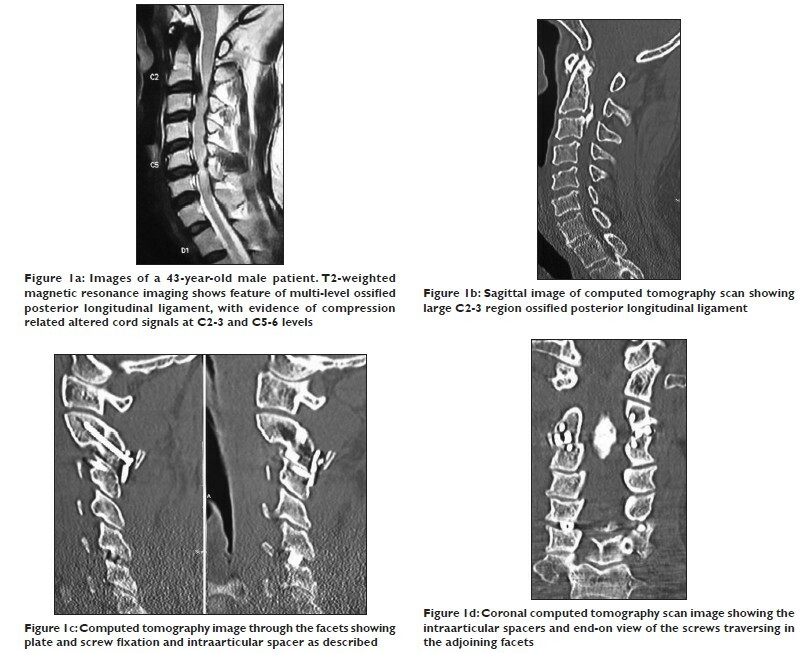 Conclusions: In Hangman's fractures Type II and IIA with severe vertebral body and pedicle displacement, NSA technique is an effective and reliable treatment alternative for the approximation of posterior elements to the C2 vertebral body, which is tilted, angulated, and dislocated. 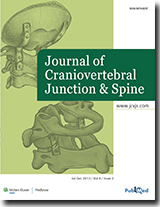 Aim: The author reports early post-operative outcome and preliminary experience with an alternative form of treatment of cervical degenerative or spondylotic disease leading to spinal canal stenosis that involves fixation-arthrodesis of the affected spinal segment using one or two (double insurance) transarticular screws for each joint. 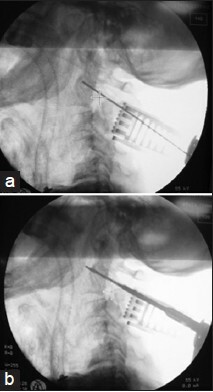 Materials and Methods: During the period of months from March 2013 to July 2013, six patients having cervical spondylotic cord compression were treated with transarticular method of screw fixation of the involved segments. The operation involved section of the spinous process at its base, opening up of the facet joint, denuding of articular cartilage, placement of intraarticular cavity bone graft chips and insertion of either a single or two transarticular screws at each level. The fixation was done in four levels in four patients and at two levels in two patients. Japanese Orthopedic Association score, visual analog scale (neck pain) and Odom's criteria were used to monitor the clinical status of the patients before and after the surgery and at follow-up. Results: Immediate post-operative and a relatively short-term post-operative outcome was remarkably gratifying. During the average period of follow-up of 6 months (range: 3-8 months); there was varying degree of recovery of symptoms. The procedure resulted in firm stabilization and fixation of the spinal segment and provided a ground for arthrodesis. No patient worsened after treatment. During the period of follow-up, all patients showed remarkable and progressive recovery in symptoms. 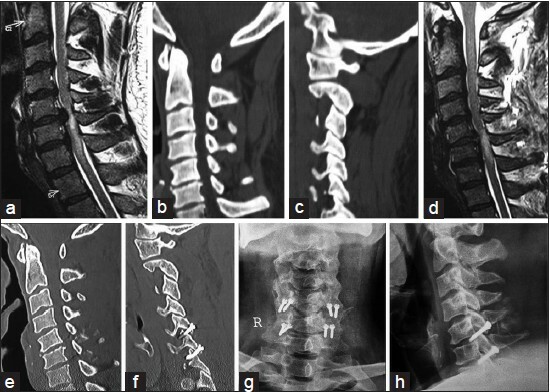 Conclusions: Vertical instability and telescoping, listhesis or overriding of the facets on physical activity seems to be the defining phenomenon in pathogenesis of cervical spondylotic disease. The clinical outcome in our patients suggest that only fixation of the spinal segment can be a rationale form of treatment. Transarticular method of treatment is a simple, safe and effective method of spinal stabilization. The firm stabilization at the fulcrum of cervical spinal movements provided a ground for segmental spinal arthrodesis. Use of two or "double insurance" screws at each facet is possible and provides reassuring stability in selected cases. Osteoblastoma (OB) is a rare bony neoplasm constituting around 1% of all primary bone tumors. Although the vertebrae and long bones are the most common sites affected by OB, skull remains a relatively uncommon site of occurrence. Aggressive variant of OB is histologically intermediate between an indolent conventional OB and a malignant osteosarcoma. To the best of our knowledge, aggressive osteoblastoma (AO) affecting the craniovertebral junction has not been previously described in the literature. 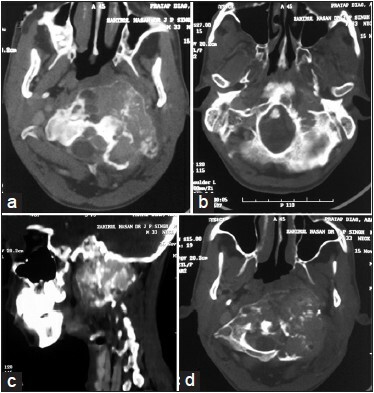 In this report, we present a 34-year-old gentleman who presented with a mass involving the left side of the neck and oral cavity along with ipsilateral lower cranial nerve paresis. Computed tomography and magnetic resonance imaging scans of the craniovertebral junction revealed a heterogeneously enhancing expansile lesion with areas of destruction involving the clivus, left sided jugular foramen and left side of first two cervical vertebras. Angiography showed distortion of the V3 segment of the left vertebral artery and shift of the ipsilateral internal carotid artery. The tumor was maximally excised through far lateral approach. Histopathologic examination revealed a diagnosis of AO. The patient was referred for radiotherapy for the residual tumor and was doing well at 5 months follow-up. A wide variety of congenital anomalies are observed around the craniovertebral junctional area. However, hypertrophied unilateral lateral mass of atlas in association with chiari-1 malformation leading to myelopathy is extremely uncommon. 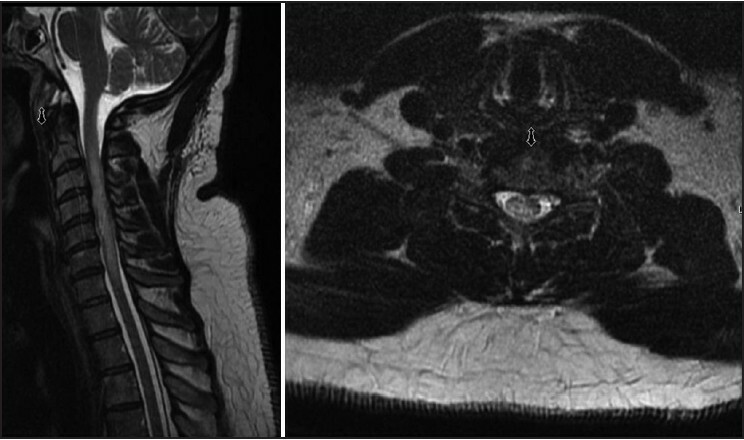 Herein we report a case of 28-year-old female who presented to us with a high cervical compressive myelopathy. Imaging revealed bony hypertrophy involving right sided C1 lateral mass along with chiari malformation-type 1. 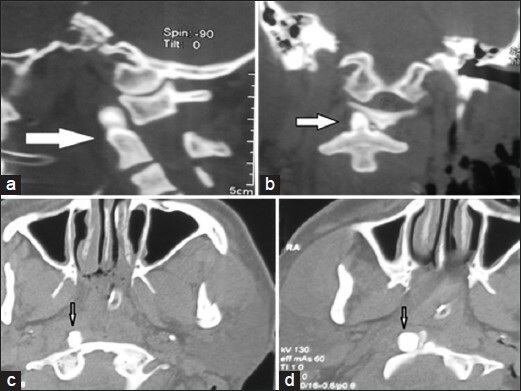 She underwent transoral as well as posterior decompression followed by occipito-cervical fusion. The authors discuss their case in light of other such reported cases and present a review of the literature. Isolated spinal cord neurosarcoidosis (NS) in the absence of systemic disease or intracranial involvement is exceptionally rare. Adjunctive laboratory tests though useful may not be reliable and the absence of any pathognomonic radiological features makes the diagnosis difficult. As spinal cord NS may be a presenting feature of systemic sarcoidosis which may be occult on routine workup, 18 F-fluorodeoxyglucose-positron emission tomography (FDG-PET) may be of value in unraveling this systemic involvement avoiding biopsying the spinal cord. A case of truly isolated NS is described with review of literature on this enigmatic pathology. Long segment intramedullary signal changes with focal parenchymal along with dural/meningeal enhancement in the absence of significant cervical stenosis in a young patient of northern European or African-American decent is very suggestive of NS and although may be presumably treated with steroids; there should be a low threshold for spinal cord biopsy especially in the absence of response to steroids to confirm isolated spinal cord NS in a patient with clinical neurological deterioration. Vertebral osteomyelitis and discitis are mainly due to bacterial infections though fungal infections are one of the important causes of morbidity and mortality in immunocompromised patients. Aspergillus involving intervertebral disc space is extremely rare. 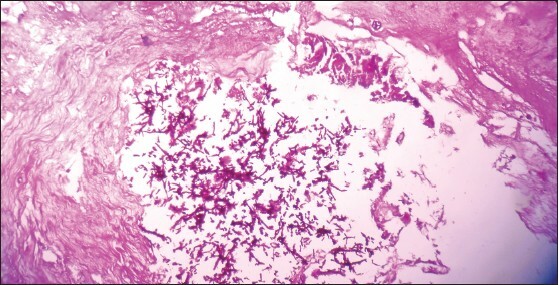 We report a case of aspergillosis of intervertebral L5-S1 disc space with spinal epidural abscess in an immunocompetent 45-year-old female which can add on to a few case reports described in literature as well as an insight for clinicians regarding this rare spontaneous infection in an immunocompetent patient. The sequelae of atlantoaxial instability (AAI) range from axial neck pain to life-threatening neurologic injury. Instrumentation and fusion of the C1-2 joint is often indicated in the setting of clinical or biomechanical instability. This is the first clinical report of anterior Smith-Robinson C1-2 transarticular screw (TAS) fixation for AAI. The first patient presented with ischemic brain tissue secondary to post-traumatic C1-2 segment instability from a MVC 7 years prior to presentation. The second patient presented with a 3 year history of persistent right-sided neck and upper scalp pain. Both were treated with transarticular C1-2 fusion through decortication of the atlantoaxial facet joints and TAS fixation via the anterior Smith-Robinson approach. At 16 months follow-up, the first patient maintained painless range of motion of the cervical spine and denied sensorimotor deficits. The second patient reported 90% improvement in her pre-operative symptoms of neck pain and paresthesia. Anterior Smith-Robinson C1-2 TAS fixation provides a useful alternative to the posterior Goel and Magerl techniques for C1-2 stabilization and fusion. Study design: Retrospective review of the case file. Objective: The primary objective was to report this rare case and discuss the mechanism of dislocation and technique of manual closed reduction of C1-C2 vertebrae in such scenarios. Summary of background data: Posterior atlantoaxial dislocation (AAD) is extremely rare and a few cases have been reported in English literature. This young man sustained a high speed car accident and survived an extreme hyperextension injury to the craniovertebral junction (CVJ) without any neurological deficits. On evaluation for neck pain he was noted with a dislocated odontoid lying in front of Atlas. There was C1-C2 facet diastases. No bony injury was noted at CVJ. Transverse axial ligament (TAL) was intact. He underwent a successful awake reduction of the dislocation. The joint had to be manually distracted, realigned, and released under the guidance of fluoroscopy. This was followed by single stage C1-C2 Goel's fusion with awake prone positioning. This patient was able to go back to work at the end of 3 months (GOS 5). Conclusions: This condition is extremely rare, can be carefully reduced manually under adequate neuromonitoring, and requires C1-C2 fusion in the same sitting.